This stylish apartment with contemporary furnishings is fully self contained and suitable for couples. We offer the highest standard in service, presentation and genuine hospitality. Commanding views from the lounge/dining and both bedrooms, overlooking the marinas with the Casino and river in the background. The fully equipped kitchen, also with water views, is complimented with an oven and cooktop, a dishwasher and large fridge. It is well laid out, featuring stone bench tops and is open plan to the loung/dining. Bedroom 1 has a Queen size bed, quality linen and is tastefully decorated. There is also built-in wardrobes with mirrored doors and wall mounted TV. Bedroom 2 has a Double bed, quality linen and built-in wardrobe with mirrored doors. Both beds are fitted with electric blankets for your comfort. The bathroom features a large shower, hand basin, washer/dryer combo, iron and board. The apartment is situated in the heart of Sandy Bay, one of the most prestigious and desirable suburbs in Hobart. 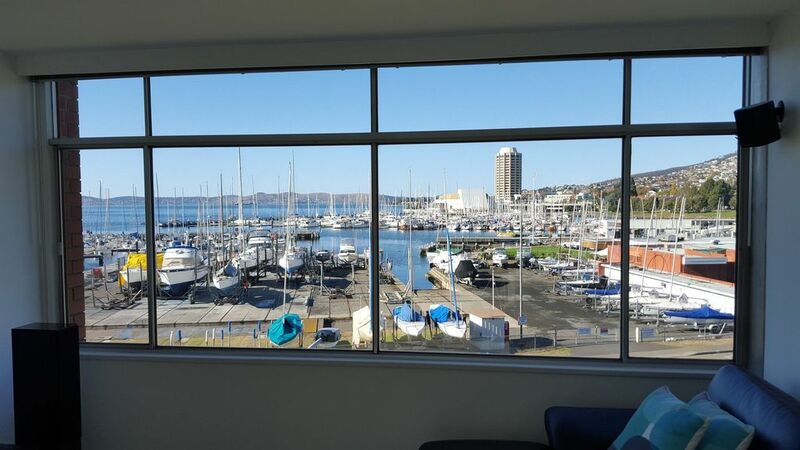 It overlooks the Derwent Sailing Squadron and Royal Yacht Club, is 500m from the University of Tasmania and 5 minutes walk to Wrest Point Casino. The Sandy Bay shopping centre is just a 5 minute walk, offering a rich and diverse selection of approx 40 restaurants and coffee shops, as well as 2 supermarkets, banks, doctor's surgeries, pharmacies, post office and boutique retail shops. The city centre is a leisurely 20 minute walk through beautiful, historic Battery Point and Salamanca. MONA and the Hobart International Airport are a 30 minute drive by car. - bus stop is just 400m from the apartment with regular public bus transport to the city centre. - Free OSP is available at the Apartment. - Drive up Mt Wellington and take in the panoramic view from Bruny Island to Bridgewater and beyond. - a $10 taxi fare would take you from the city centre to the Apartment. - Complimentary tea/coffee etc is provided. - There is no capacity for extra beds in the Apartment. No cots or extra beds are available. Clean, lovely apartment with convenient parking right in front. We loved walking around the neighborhood. Excellent modern apartment with beatuiful views. Comfortable apartment with a great outlook from all rooms. Fantastic Harbour view! Convenient located, the flat is very détails in design and user friendly. We enjoyed our stay there for 2 nights. Will come back. We thoroughly enjoyed our stay at Sandy Bay in Hobart. The unit was clean, well equipped and comfortable, and had lovely views. It is not central, but is within easy walking distance (15/20mins) of Battery Point and Salamanca, and a bit further to town. It is also close to supermarkets and shops on Sandy Bay Rd. Would recommend this place which accommodates up to 4 people. 4 of us stayed here for 2 nights and all of us wished it could have been longer. Thank you for your review and so pleased you enjoyed your time at our apartment. HObart is a great city and next time you will have to stay longer.